Ananya Dance Theatre is a professional company of primarily women artists of color. We are fierce optimists who believe that creating with intention can make a difference in the world. Our socially engaged artistic process builds community and nurtures leadership in cultural activism. This community includes our dancers, artistic collaborators, staff, board members, social justice collaborators, and audiences. We imagine our community in terms of three concentric, overlapping circles. In the innermost circle are the artists of Ananya Dance Theatre, women from global communities of color, working in the Twin Cities with the belief that their artistic practices are important forces of healing, joy, beauty, and community. The next circle includes our staff and board and all our families, who keep the company going and whose advocacy is crucial to our growth. The outermost circle embraces participants in community workshops, audiences, and communicators via social media. Our performers take pride in their identity as both committed professional dancers and cultural activists. We believe in and practice the immediate association of the aesthetic and the political. We believe that the powerful dancing of women of color, arising from our rage, joy, struggles, and aspirations, prepares for groundbreaking shifts towards justice in our communities. Dancing toward excellence and justice means conjuring and manifesting an-other reality where marginalized communities and different notions of beauty and power are activated, transformative possibilities are embodied, and shifts in paradigms of power can occur. 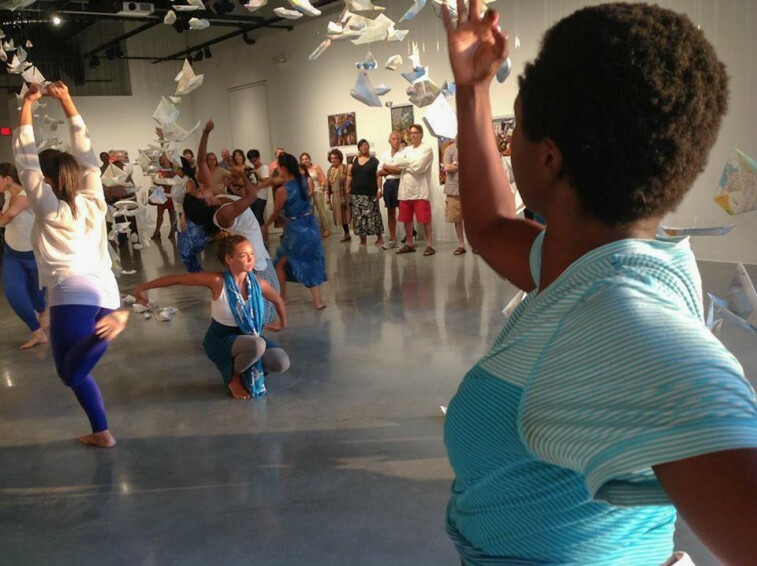 Performing at the “Flotilla for Peace” installation, Katherine E. Nash Gallery, Minneapolis, MN. July 11, 2013. Ananya Dance Theatre acknowledges with gratitude the numerous contributions of time, creativity, consultation, and resources provided since 2005 by the following individuals in the areas of artistry, administration, production, and governance.